Julia and I returned last night from the District. We took a true vacation to Washington DC to visit some friends of ours. We also saw some extra-typical District stuff. Thanks to our wonderful friends the Kazees, Rob, Jane, Abby, and Lilly, we stayed just off of Georgia Ave in the heart of the District. We parked the car and road the Metro for the entire week (except when we went to visit Julia's cousin). DC has an amazing public transit system. We only waited long for a bus twice and both times were off hours. Here are a couple of highlights of our trip. 1) We got to see and visit one of our favorite families in all the world, the Kazees. Rob Kazee is pastoring at National Church of the Nazarene and they live only a few blocks from the church in a beautiful parsonage there in the District. I taught the girls to stack and we had fun with that all week. We all went to the National Zoo on Friday. 2) The evening we spent with Rob and Brian Postlewait at a German restaurant downtown. We enjoyed an evening of our favorite kind of conversation: God, Church, and friends. 3) We got to see Julia's cousin Lenora and her family. They live on a dairy farm (her husband Richard is a dairy farmer) in Mt. Airy, MD. That was fun. 4) We visited another of our favorite families, the Freys. Eric and Antonina pastor Toronto Church of the Nazarene in Toronto, OH. They took us out on the river in his boat. What fun! 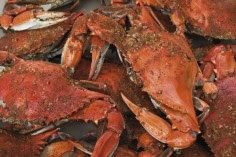 5) I ate 19 crabs at the Dancing Crab, a little shack off of Wisconsin Dr. in the District. 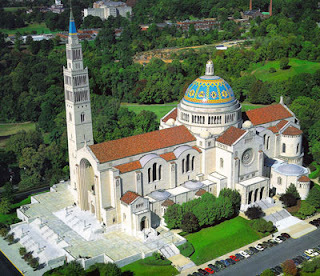 6) We visited the National Shrine of the Immaculate Conception, a Basilica at Catholic University of America, again in DC. The Basilica was a kick back to Byzantine architecture with small prayer shrines off of the main Cathedral dedicated to churches around the world. Very beautiful. I think those were my favorite things. Julia will probably post some more details. D.C. is one of my favorite places to visit. There is so much to see, do and eat there. Sounds like you had fun--about time for a REAL vacation for your two!! !